Researchers used a mobile air quality monitor similar to this EPA van to study wood smoke’s effects on PM2.5 in Northern Utah. Researchers from across the state gathered at Utah State University on March 28, 2019 for the third annual Air Quality: Science for Solutions conference. The mission of this annual meeting is to facilitate the cross-pollination of ideas and the development of solutions to Utah’s air quality problems. This conference targets academic researchers from various disciplines as well as professionals from the industrial, regulatory and public realms. Topics of interest include atmospheric chemistry, health impacts, meteorology, emissions, modeling and policy. Utah Department of Environmental Quality’s (DEQ) Division of Air Quality (DAQ) staff helped plan the event and participated in the some of the research projects. One presentation of particular note was on new findings about wood smoke sources during wintertime inversions. Jesse Glisson, along with researchers from the Department of Chemical Engineering at the University of Utah and the Division of Air Quality, looked into the contribution of wood smoke to PM2.5 levels. They wanted to assess how wood smoke is affected by temperature, heat deficit, and residential wood-burning restrictions. Wood smoke is the product of incomplete combustion. As the wood burns, volatile organic compounds (VOCs), nitrogen oxides (NOx), and fine particulates are released. During inversions, these VOCs and NOx react to form small particles called PM2.5. As these particles build up in the valleys, they can reach unhealthy levels. In fact, during an inversion, wood smoke can make up to 15 percent of PM2.5. These particles are so small they can penetrate deep into the lungs of residents and exacerbate heart and lung conditions. As part of Glisson’s study, researchers measured the levels of wood smoke using a mobile air quality monitor inside a van. One of the instruments inside the van was an Aethalometer. Aethalometers are instruments that can measure the concentration of optically absorbing suspended particulates in a gas. In this case, the Aethalometer was measuring wood smoke in the air. 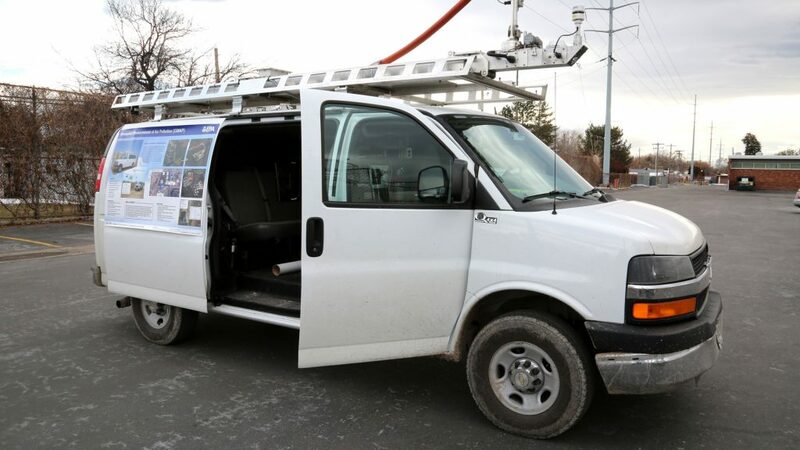 Researchers drove the mobile air quality monitor in specific routes collecting samples in Northern Utah that are in non-compliance with EPA’s PM2.5 air quality standards. These data were then analyzed for a specific chemical marker from wood-burning. 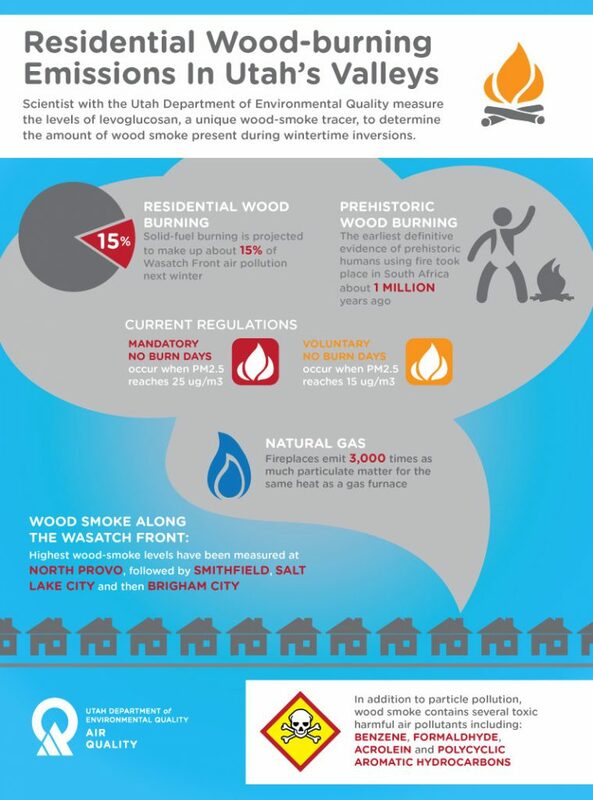 The data were gathered in both residential and commercial zones to capture a complete snapshot of wood smoke sources. Once the data set was complete, researchers used special software to identify areas with the highest concentrations of wood smoke. In addition to the location of the wood smoke, they analyzed the data to see when these levels reached their peak during the day. The software used in the project was previously used at the University of Utah for Logan Mitchell’s “TRAX Air Quality Observation Project.” In that project, air pollution sensors were deployed on two TRAX light rail cars that traverse the Salt Lake Valley on the Red and Green lines. The software allowed researchers to analyze spatially-explicit air quality data. After analyzing the data a few things became clear to researchers. First, residential wood-burning still occurs regardless of restrictions. Although many residents have changed their lifestyles, there are still many who are unaware or stubborn about following wood-burning restrictions. The second finding was that commercial wood-burning is a contributor to PM2.5 levels in the Salt Lake area. The scientists couldn’t be 100 percent certain of their findings, and more research is needed, but the data suggests that commercial sources, such as wood-burning restaurants and other industrial sources, are contributing more wood smoke pollution than expected. These findings present scientists and regulators with an opportunity to educate commercial locations that have flexibility with when they have to burn wood. We all breathe the same air and we all have a responsibility to ensure that human health is protected from the ill effects of air pollution. Utah has made many important strides in improving air quality and air pollution along the Wasatch Front. Population growth, however, will continue to tax our air shed. Understanding the causes and chemistry behind air pollution is an important step to effectively regulating and improving the air we all breathe. 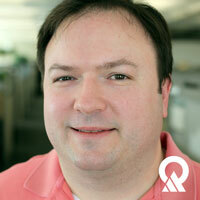 Chris Pennell holds a master’s degree in atmospheric science from the University of Utah. He works as an air quality modeler for the Division of Air Quality.